PRODUCT: 4 inch wide Stainless Steel Paint Scraper / Putty Knife with Soft-Grip Handle, and flexible Stainless Steel Blade. Price/Each. 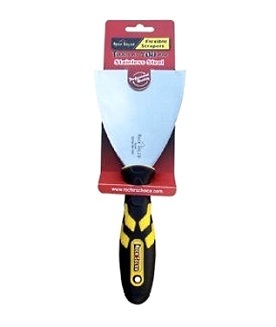 DESCRIPTION: FLEXIBLE STAINLESS STEEL TOOL CAN BE USED AS SCRAPER OR SPREADER.